Scientists from RIDEM collecting data in a Rhode Island wadeable stream. Photo courtesy of RIDEM. 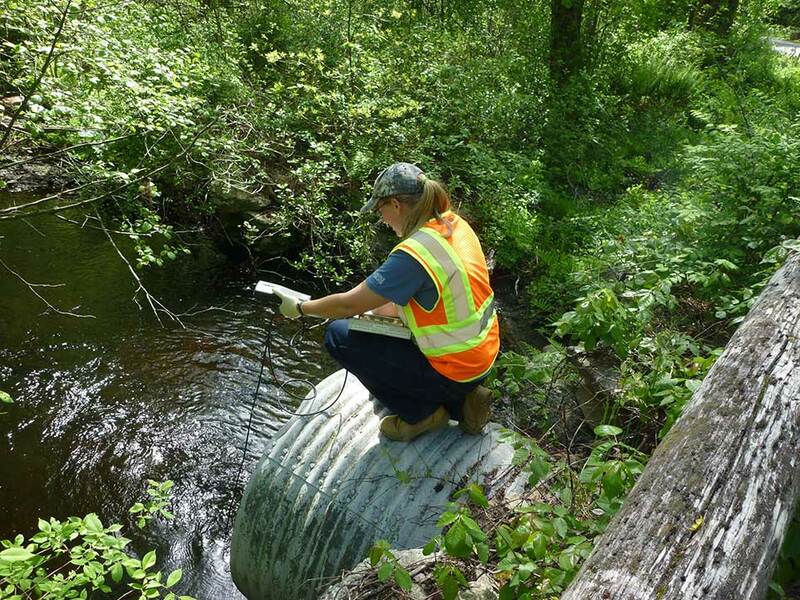 The RI Department of Environmental Management (RIDEM) monitors wadeable rivers and streams using a rotating basin monitoring strategy. Over 200 stations have been established through this program, which was initiated in 2005. Typically, each year, the wadeable rivers in a different portion of the state are monitored on a cycle designed to allow RIDEM to sample and assess all watershed basins within Rhode Island over a five-year timeframe. Specific wadeable rivers are selected within the watershed basin in order to provide representative coverage of water quality conditions throughout the river system. Typically, 60-70 sites are monitored each year. RIDEM has determined certain small coastal streams as inappropriate for inclusion in this program due to site conditions. Each selected wadeable river is monitored from May to October for physical, chemical, and pathogen parameters. Physical parameters include water temperature, flow rate, turbidity (water clarity), and observations such as fallen trees, undercut banks (water has eroded below the visible edge of the bank), and unusual odors. Chemical parameters measured in the field include pH, dissolved oxygen, and conductivity. Other chemical constituents are determined by laboratory analysis. 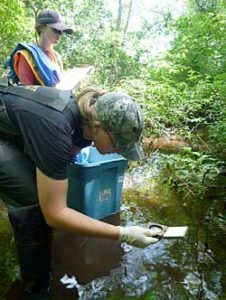 At a subset of stations, macroinvertebrates are sampled, counted, and identified to taxonomic genus and species (when possible) in accordance with EPA Rapid Assessment Protocols. For more details, see the Quality Assurance Project Plan and its addenda. Rhode Island Department of Environmental Management with technical support from New England Interstate Water Pollution Control Commission, lab services from Rhode Island Department of Health, and taxonomic services from an independent contractor. 2013 RIDEM seasonal intern, Liz Futoma, assisting in monitoring and data collection efforts in wadeable rivers and streams throughout Rhode Island. Photo courtesy of RIDEM.